A man who always finds his garden shed arranged every morning was shocked when he found out it is a tiny mouse that has been tidying up. 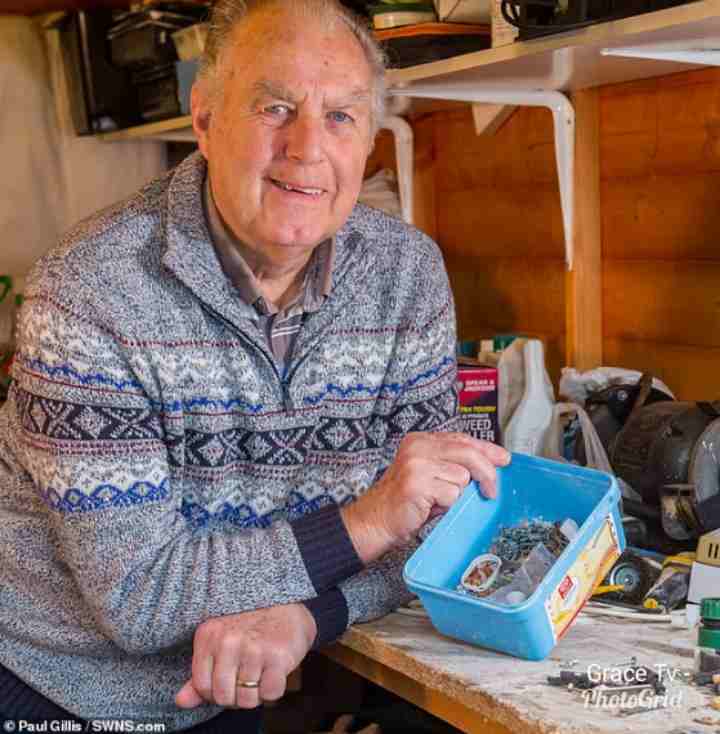 Stephen Mckears, 72, noticed things moving in his shed in Severn Beach, South Gloucester a month ago. He would empty a plastic tub of metals onto his work bench but when he returns in the morning, he'll find that the metals have been placed back in the tub. The retired electrician first saw plastic clips appear in an old ice cream tub filled with peanuts which he keeps to feed the birds. And each night more objects began to accumulate. 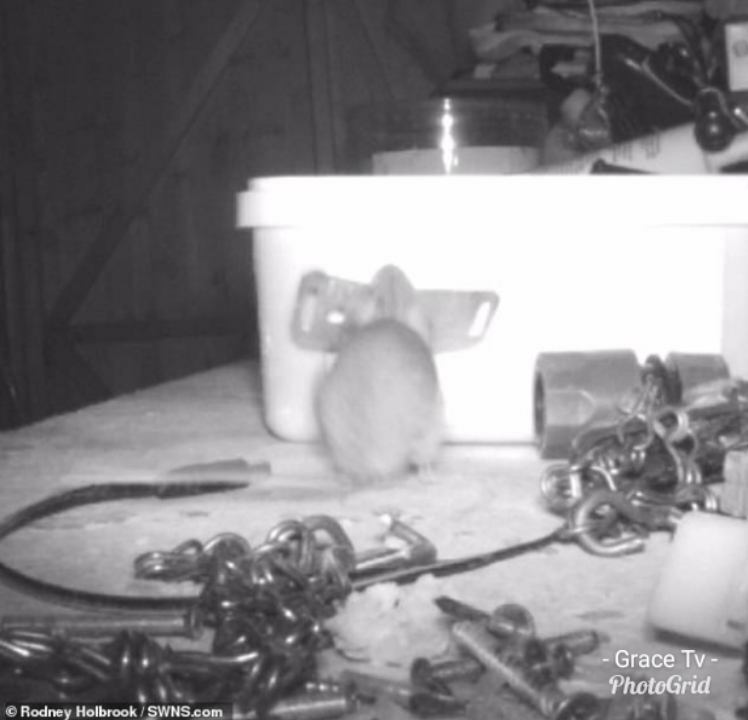 After weeks of finding large screws, plastic leads, nuts and bolts neatly filed away, he decided to set up a hidden camera to uncover the mystery guest. His neighbour Rodney Holbrook, 70, helped him set up the camera to film what was going on in his shed overnight. In the morning, Mr Mckears and his neighbour were left baffled when the footage showed a mouse busy tidying the shed and even attempting to lift objects twice his size. The mouse tidied away the metal objects from around midnight to 2.30am - an activity it has been doing every night for around a month. t was doing it for about two hours that night - he must have had to go for a sleep after it.I've seen a mouse moving objects to make a nest but never metal objects. It's quite amazing.It's still busy doing it now. Mr McKears added:'ve been calling him Brexit Mouse because he's been stockpiling for Brexit.The heaviest thing was the plastic attachment at the end of a hose pipe - and the chain of an electric drill.I didn't know what it was at first. The kids were saying it was a ghost.One day I emptied the tub out and spread the contents on the side - and the the next day they were all back in again. I thought I was going mad. Mr Holbrook, who lives just a few minutes drive from his friend, is a keen wildlife photographer and said he had to see the mouse for himself. He said:'ve been calling him Metal Mickey but some people have been saying he's just mouse proud.I was quite amazed to see it - it is an amazing mouse..teve asked if he could use my trail camera to film whatever it was that was moving the objects in his shed.The mouse was chucking things into the box - we thought it was a ghost or something at first. I thought I have to see this for myself.